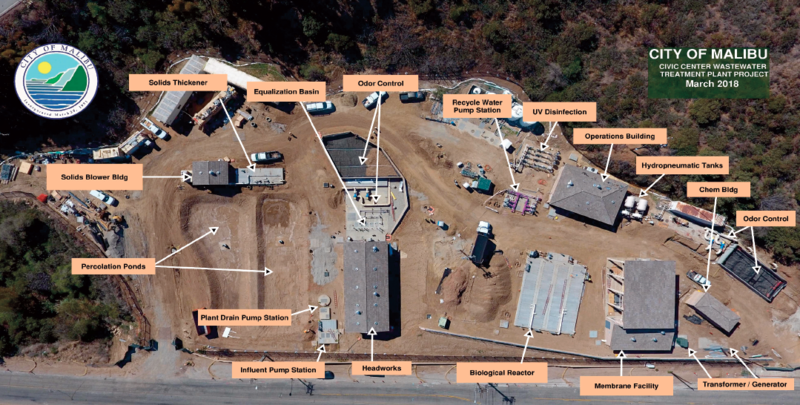 DESCRIPTION: Integrated Water Services, Inc. (IWS) was a key team member on a $24 million recycled wastewater plant to service commercial businesses in the Civic Center area of Malibu, CA. The MBR treatment plant is designed for flows up to 188k GPD (with expansion to 376k GPD) that will meet Title 22 requirements for Disinfected Tertiary Recycled Water. The membrane system will be used in conjunction with biological reactors to perform biological treatment and membrane separation to meet regulatory requirements. All effluent not re-used in the municipal purple pipe system will be directed to deep well injection adjacent to the Pacific Ocean for dispersal. IWS was responsible for the complete electrical scope on the project including I&C, transformer, standby diesel generator, Motor Control Centers, Distribution Panels, Instrumentation, Duct Banks, PLCs, Fiber Optic Patch Panel and system to communicate with offsite lift stations, building electrical, and all related electrical equipment, material and supplies along with start-up. Solids building, Operations and Laboratory building, HVAC, electrical, instrumentation/controls, mechanical, demolition, sitework improvements and landscaping and irrigation. The membrane system has two process trains to handle the continuous wastewater flow and provisions for two additional future trains. The MBR manufacturer was Suez Environmental (formerly GE-Water Process Technologies (Zenon) LEAP MBR system) and utilizes a hollow fiber configuration. The electrical installation included over 33,000 linear feet of conduit, 60,000 linear feet of wire, and 200 yd3 of duct bank encasement. The Control System included control panels, PLC and Operator Interface hardware and software, Membrane Control System software package, data links with the City’s Plant Control system, OIT graphic display configuration, instruments, and instrumentation and control components.